The prospective diner taking a glance through some online reviews of Princi could be forgiven for feeling baffled as to what exactly the Soho venue is offering, pizza-wise. While half the write-ups we perused before our visit waxed lyrical about wood-fired Neapolitan delights, at least as many again displayed pictures of an unappetising range of doughy, door-stop pizza-breads. As it turns out, both are available under the same roof, with this spacious Wardour Street site playing host to an informally rustic bakery as well as a dedicated pizza restaurant. It was the latter we were interested in, as we joined the short queue away from the communal benches of the bakery, where a (slightly) more formal dining experience awaits. 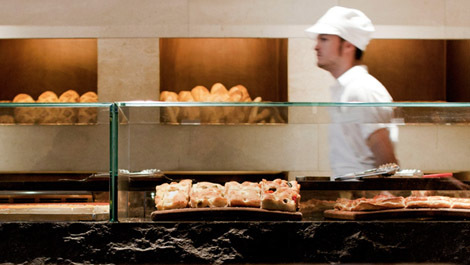 Introduced to the capital by Wagamama entrepreneur Alan Yau, Princi is the first London outpost of a chain of Milanese bakeries, and much like the popular pan-Asian franchise, the pizzeria sits in a buzzy, well-lit space where fellow diners are nestled together at close quarters. It stops short of the shared benches popularised by Wagamama (although as mentioned, they crop up in the adjoining bakery), but every inch of space is accounted for in what is a fairly compact dining area. Good job too, since the pizza on offer is worth crowding around. Our Diavola was a particularly good take on the classic pork and chilli combination, its notably high-grade Ventricina salame complemented perfectly by a pleasantly powerful kick of heat. Boasting well-charred crusts and a stretchy, sourdough base, this alone was worth the price of admission, the kind of pizza you’d happily join a queue for on a busy evening in Soho. The Napoletana was a slightly patchier affair, with the classic combination of anchovies, olives and capers overwhelmed by a staggering amount of chopped garlic. 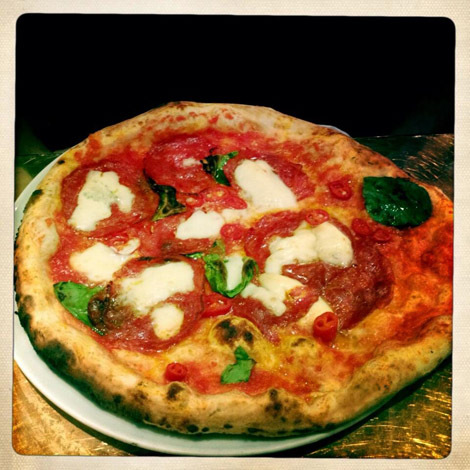 With no mozzarella to temper it (this is a marinara take on the Naples favourite), the garlic overpowered all other flavours, a shame, given the superior status of both base and crust. 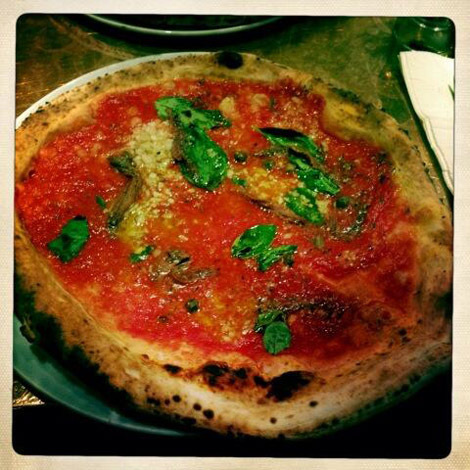 This entry was posted in Soho and tagged Alan Yau, Central, Diavola, Napoletana, Pizza, Princi, soho by thelondonpizzablog. Bookmark the permalink.